Often times, "quaint" and "charming" can be real estate code words for "small", but that is certainly not the case with this open and airy four bedroom, four and half bath home. The open floor plan reflects the area's laid back, casual luxury and the décor reinforces the beach cottage feel. 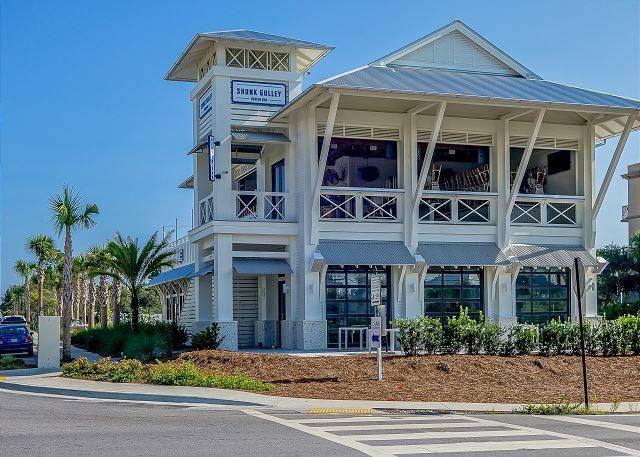 Just a short walk to the beach as well as some of Santa Rosa Beach's favorite restaurants and shopping, this home is perfect for visitors looking to be in the middle of the action. The first floor is home to a formal dining area with seating for eight, as well as a more casual breakfast bar. The breakfast bar and spacious counter tops are granite and the restaurant quality appliances are stainless steel. The intimate first floor living area has a flat screen television. The home offers wireless internet and premium cable. The first floor king suite has a full, private bathroom and large rain head shower. There is plenty of closet space in this room as well. The laundry room with a high capacity washer and dryer is discreetly tucked away on the first floor. The front porch is welcoming and spacious enough to enjoy sunrises and sunsets and the outdoor shower is an added bonus-helping you keep the hardwood floors sand free. The bedrooms located on the second floor have the best views. There is an additional living room, complete with sleeper sofa, flat screen television and full bathroom. The two queen bedrooms both have full, private bathrooms. All the bedrooms have flat screen televisions. The "bunk room" with two twin bunks is perfect for smaller guests and sleeps four. Less than a five-minute walk from the beach, this recently developed area has a newly added in ground, fenced in pool complete with lounge chairs. Surrounding palm trees make for a tranquil, serene fresh water getaway. SUGGESTED ITEMS TO BRING: Beach towels, sunscreen, camera, radio/ipod, paper towels, toilet paper, trash bags, dishwasher detergent, laundry soap, bath soap, bicycles, rafts, coffee filters, antiseptic, flashlights, umbrellas, and fishing gear. From the moment we walked into the doors of Little Birds Nest, our expectations were beyond what we ever expected. This very well maintained home instantly made me feel as though I was steps away from the beach with the well thought out decor, and the cleanliness was excellent!! This home had everything we needed In the kitchen to prepare everything from a cup of coffee to nice family dinners. Perfectly nestled in the relaxing community of Blue Mountain Beach. This home was steps away from a relaxing pool, and a short 5 minute walk to the breath taking beach. The kids enjoyed the ice cream shop on the quick walk back from the beach! The management company was very welcoming and provided stress free booking and information about our stay, provided information on local dining, shopping, and checking in and out was a breeze. This is by far the best management company I have ever booked through. My entire family experienced the vacation of a lifetime and have decided to make this an annual tradition to return to The Little Birds Nest. We are already counting down the days until our return.